Today I'm sharing a furniture refinish. I had been looking for something that could house all of our games. Right now we have board games in two bedroom closets and card games are in the kitchen. So when I came across this at a yard sale, I knew it would work perfectly. I snagged it for only $8. It was part of a huge three piece entertainment center. Luckily, they didn't make me buy the whole set. My husband thought it was just a boring box, so he added baseboard and crown molding to give it some character. So this is not a true before picture, but you can imagine what it looked like. I took off the doors and gave it a quick sand. Then I painted the outside a light green I had left over from my basement. The color is Prairie Sage by Glidden. I left the interior white. Then came the fun part - stenciling. I searched through the online Silhouette store and found this damask pattern. Next I cut out some smaller stencils and painted them on the sides. Both on the bottom and the top of the cabinet. This was so much easier and quicker than my last stenciling project. Once I was done painting, there was the problem of the glass door. I wanted to keep games inside, but that's not always very pretty. I decided to frost the glass. But I wanted to keep the damask theme, so I cut out some vinyl and put it in place. I also taped the edges off and started applying the etching cream. The bottle says it is not intended for large areas, and I wouldn't recommend it if you want it to turn out perfectly. There were a few spots that looked uneven, but overall I'm happy with the results. I lightly sanded over the stenciled areas and also along the edges to let some of the white paint show through. It fits perfectly in this spot at the bottom of the stairs. These pictures best capture the true color of the piece. I spent a total of $9. The cabinet was $8 and I spent $1 for the Silhouette stencil. I used leftover paint and etching cream. The baseboard and crown molding were also left overs. I love a good makeover that doesn't end up costing me a lot. What do you all think of the result? Do you like the color and the stencil? Oh I love it! Fantastic job on it! And yes, the colours are perfect! I've been looking at the Silhouette site, but not sure I can afford the cutting machine. And not sure I would have a steady enough hand to cut out my own stencils that I've seen around the web. And to buy them pre-made are so expensive! It looks beautiful Rachel! I love how great a deal it was too. What an awesome piece! YOu finished it beautifully. Thanks so much for linking up at One Creative Weekend! Your project turned out very nice! Love it! 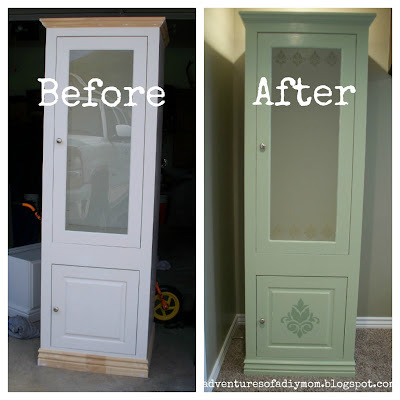 Great cabinet for an excellent price - I like your stenciling touch!